Southern Formula is proudly built in Australia by craftsmen who have been in the business for over 60 years. Our design and manufacturing team consist of qualified boat builders and a full time Naval Architect. These boats have been designed to produce greater performance over older designed boats from the 70's. Our goal was to improve on a few key features: better ride quality, better stability, more efficient hull, dryer ride with overall features and benefits internally. Southern Formula is the brainchild of John Haber, owner of Haines Hunter boats, and the old-school design, and name throwback to the Haines Hunter Formula 233, certainly had people talking and wondering if this boat was a flop of the old 233 or a new design altogether. However the Southern Formula 24 is nothing like a 233 and is its very own beast. Anyone familiar with old Haines Hunter models could instantly recognise this boat was markedly different. While the deck and wavebreaker might have some 80s flair, nothing else about it has the design characteristics of an old Haines Hunter Formula. Our mission was to design a superior fishing boat for its intended use, not for a race boat. The final result could be argued to have achieved both! 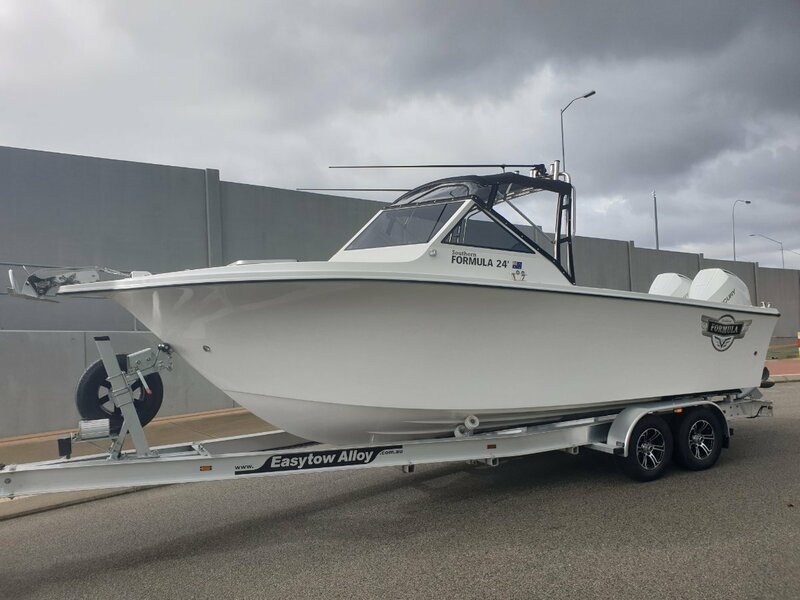 There is no doubt that the new Southern Formula range will be one of the best blue water fishing boats produced in Australia. - Hinged dive door Std. - Duel bait tanks Std. - Long range fuel tank 380L Std. - 440L underfloor storage Std. - Full length bunks Std. - Heavy duty deck hardware Std. - Full foam filled hull Std. - ECM Stringer system Std. Transom Height S-30" / T-25"
We offer both Mercury and Yamaha engine packages, suitable for Single or dual outboards.